If you’re pregnant, I’m going to guess you’ve probably heard that sentiment in one way or another – maybe from your mom, your best friend, all those books that are supposed to “prepare” you for childbirth, or maybe absorbed right from movies or TV shows. How’s that for some inspiration as you go into what is arguably one of the most important days of your life? Do any of those fears ring true for you? If they do, you’re far from alone. As a fellow type-A kinda woman, I get it. Giving birth means giving up control. It means trusting others (or at least, the universe/God) to take care of you. And it means not knowing what’s going to happen – until it happens. So, if you’ve been keeping yourself up at night with all these negative thoughts, I want you to know you’re not alone. Pregnancy might be magical, beautiful and exciting (or not – especially if you’re constantly sick!) but it’s also the biggest unknown a woman will ever experience. And if you’re at all like most, you’re probably just hoping to hell your body knows how to birth another human. I mean, women have been doing this for centuries right? … Right? But what if there was something you could do to start feeling excited and empowered about giving birth? How would life (and your pregnancy and relationships) be different if you could stop being afraid of the unexpected and instead felt confident to roll with the punches, handling whatever your unique birth experience has in store for you? What if you could birth from your heart instead of your head – feeling courageous and calm? What if you felt safe in your body + comfortable in your surroundings while giving birth – no matter where you end up? And what if instead of freaking out over the potential pain of birthing your little one, you just felt excited to meet your new baby? Giving birth can be a joyful, peaceful and positive experience – for you and your baby. 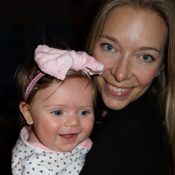 If what you really want is to bring your baby into the world in the most gentle and peaceful way possible, but you aren’t sure HOW to do that, you’re in the right place, mama. My name is Crystal Di Domizio, and I’ve worked with pregnant and postpartum women for 9+ years in various capacities as a doula and childbirth educator, holistic nutritionist, prenatal coach and EFT practitioner. Today, I’ve devoted myself to helping pregnant women uncover and release their unique fears around birth using a fascinating modality called EFT and Matrix Reimprinting so they can birth with unshakeable confidence, in the way they want to. What exactly is EFT and Matrix Reimprinting? If you’re not familiar, EFT stands for Emotional Freedom Technique, and it’s honestly the most powerful, life-transforming tool I’ve ever encountered. Basically, EFT involves tapping on certain meridian points on the body to create profound cognitive (and energetic) shifts. It’s an easy, gentle and incredibly effective way to release even the most terrifying and deeply ingrained fears around birthing your baby. And Matrix Reimprinting? It takes all of this powerful EFT work one step deeper. Essentially, it’s an advanced EFT technique that will allow us to explore the realms of your subconscious mind to find anything that might get in the way of you birthing your baby the way you want to and transform them into something more positive. In short? No more winding up in a puddle of tears when you think about giving birth. We’ll turn down the dial on your panic and make sure you go into the birthing process feeling emotionally stable – peaceful, calm and devoid of any last-minute anxiety attacks. Now, let’s talk a bit more about why you need to tackle this fear stuff head-on. Here’s what I know to be true: It’s totally normal to have a lot of fear going into the birth process. Fear is a natural response to what we don’t fully understand. Unfortunately though, fear and a positive, peaceful birth experience don’t exactly go hand-in-hand. Because a woman’s body is designed to keep her baby safe in the case of an emergency, all of this built up fear could quite possibly, literally STOP the birthing process or make it more painful than it needs to be. Quick science lesson: The uterus has two opposing muscle groups, one to open the cervix (in order for your baby to be born) and the other muscles work to keep your cervix closed in order to keep the baby safely inside. Back in the day, this was a brilliant natural response to protect the mom and baby. For example, if a lion was coming to eat her, her body would halt the birth process and keep the cervix closed so she could run to safety. What that translates to is the real pain of two opposing muscle groups working against each other (one to open the cervix and one to keep it closed) and/or a birth process that can slow down or stop. I strongly believe that sometimes complications in birth can arise from emotional (read: fear-based) blocks – ones that the birthing mother is unconsciously aware of – like past traumas, fears and all those darn childbirth scenes from movies. That said, resolving fear is one of the most important ways to prepare for a easier and more peaceful birth experience. And that’s exactly what we do with EFT and Matrix Reimprinting. Sound too good to be true? Just take a look at a few of my client’s positive and empowering experiences working with me below. After enjoying our Hypnobabies classes taught by Crystal, I was excited to work with her using EFT to clear up some remaining birth fears that I had. It was quite a powerful experience that really helped me put a voice to some of my fears and express them in a constructive way. After just one session, I already feel lighter and more confident going forward. It was a pleasure to work with Crystal and hope to do another session soon! Experiencing the effects of EFT with Crystal was very rewarding. I was experiencing some fears regarding the upcoming birth of my first child, and the discomfort management techniques that I had chosen to use during the birth. After completing a few rounds of tapping with Crystal, I immediately felt much calmer and more prepared. During the process of tapping, I was able to feel the "weight" being lifted off of my shoulders, as the burden of my thoughts slipped away. I would highly recommend this technique to anyone who is experiencing fears. 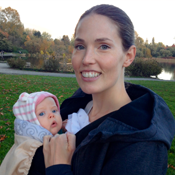 The EFT session I had with Crystal was hugely helpful in my journey to becoming a first time mother. I felt pretty confident about going into childbirth but Crystal helped me dig deep to identify some hidden fears that may have interfered with the flow of things. Not only did we identify my fears associated with childbirth, but we uncovered why they were there, and were then able to address them effectively. After our session, I felt relieved and free to have a wonderful childbirth experience. Thanks Crystal! Crystal is a skilled, intuitive and empathetic practitioner and knew exactly how to get right to the root of what I needed to address. I can’t even express how nervous I was to dig deep and how easy Crystal made it. This work is so gentle yet you experience instant results and we’ve made so much progress in our first 4 sessions. This work has changed my life and shifted things I didn’t even know were in the way. Crystal made me feel totally comfortable with the entire process. EFT and Matrix Reimprinting is so powerful. It has really helped me to get out of my own way and respond intuitively to what my subconscious was holding on to. I had some really odd memories pop up that I would have never explored further, that ended up being the key to a major shift! The benefits for me have been less anxiety, more energy and motivation, prepared and excited about pregnancy and childbirth. My desire to have another baby finally outweighs my fear of another pregnancy. I feel like my world has been blasted wide open in the best possible way. I am excited for all the possibilities out there. I can’t even express what this means to me. Thank you for what you do. Ready to begin this work together? Sitting on the fence? Every woman and baby can have a positive birth experience (even if your baby comes into the world differently than you imagined). If you’re a fearful mother-to-be who wants to feel safe, confident and calm during birth, I can help. You deserve to feel wholly prepared and unshakably courageous about birthing your baby. P.S. 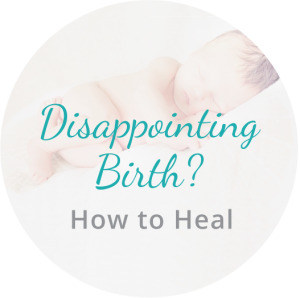 If you’ve already experienced a less-than-awesome birth, check out my Birth Healing coaching package. Immediately! Yes, you heard that right. All my clients feel tangible shifts and changes in their thoughts and feelings within the first session. It’s not a healing modality where you walk away wondering if it’s actually working or having to wait until after a few sessions to reap the benefits. It’s one of the things I love most about EFT and Matrix Reimprinting! It’s quick, easy and gentle, yet deep and sustainable. EFT stands for Emotional Freedom Technique, which is a powerful, life-transforming self care tool that you can use for life. It’s amazing at bringing down the emotional intensity around certain events or triggers – birth, for example. And while yes, lots of people do EFT on their own, I’m a certified EFT practitioner and equipped with advanced tools and techniques that help us get to root trigger – and melt it away like butter – faster than anybody can do alone. Well, let’s start by saying it does not include Keanu Reeves. Sadly. Matrix Reimprinting is an advanced EFT technique that makes it possible for us to access your subconscious and “reimprint” more positive experiences, thoughts and feelings into your mind + body at a cellular level. It sounds fancy and woo-woo, but it really, truly works. Try it for yourself and you’ll see! Do I still need to take a prenatal class? Yes! I still highly recommend taking a comprehensive childbirth education class like Hypnobabies and hiring a doula. It will increase your confidence to learn the ins and outs of your birth process, how to make informed decisions about your care, prenatal nutrition + exercise and much more. I’ve never worked with someone via Skype. What should I expect? You don’t need any fancy tools or equipment (your built-in computer microphone and camera will do). There’s no traveling involved, so you’ll need a very minimal amount of childcare. I want to make this experience as easy and convenient as possible for you. If you can find just 1-2 hours a week to devote to yourself and your healing, your life will radically change. “I met Crystal online at our appointment time. She is always punctual! I have a lot of therapy experience face to face. I wasn’t sure how skype would work. I was with antsy surprise. Crystal’s warmth, empathy, compassion and caring transmits just as well electronically as it does in person. She takes her time and is quick to pick up on your body language when you might not be doing so well, even if you try to lie. Don’t bother, she knows. Ha.” Margo T.